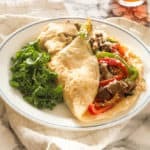 Egg white Philly cheese steak recipe – An epic high protein dairy free omelette with thinly sliced seasoned beef, sauteed onions topped with vegan cheese. I remember some years ago when myself and co went to the United States for the very first time. I was in my teenage years for my very first stateside trip and trust me it was an unforgettable experience. The food, the culture and overall lifestyle was a complete contrast to life in the UK. It was almost as if America was 10 times a head of the UK in terms of food and drink. One thing that stood out while I was on vacation was the portion sizes in the restaurants – they were humongous plus they had a system of constant buffet style eating (something that is not as popular on a grand scale over here). Although I have never been to Philadelphia, I do vividly recall going to a food joint in Florida and ordering a Philly cheese steak. It was the name more than anything which I found appealing, nevertheless I devoured the entire thing and would gladly eat seconds. In short this recipe is a protein loaded revamp of the Philly cheese steak sandwich only with the white eggs replacing the bread. Dairy free cheese choice – My favourite vegan cheese by Violife plays a key role in achieving that gooey cheese as pictured along with the most tenderised slices of seasoned beef on the planet. 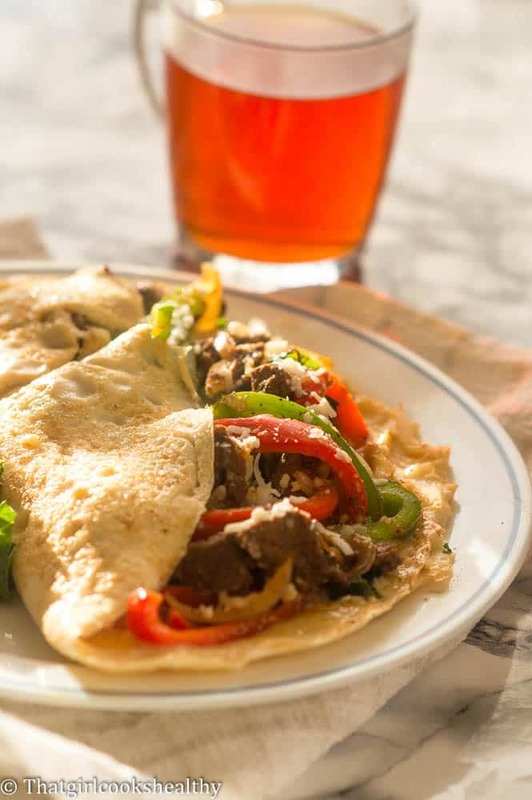 Homemade steak seasoning for the beef – I took the liberty of making a homemade steak seasoning rather then sandwiching bland meat into the omelette and I promise you will LOVE the flavour which impart from this omelette. 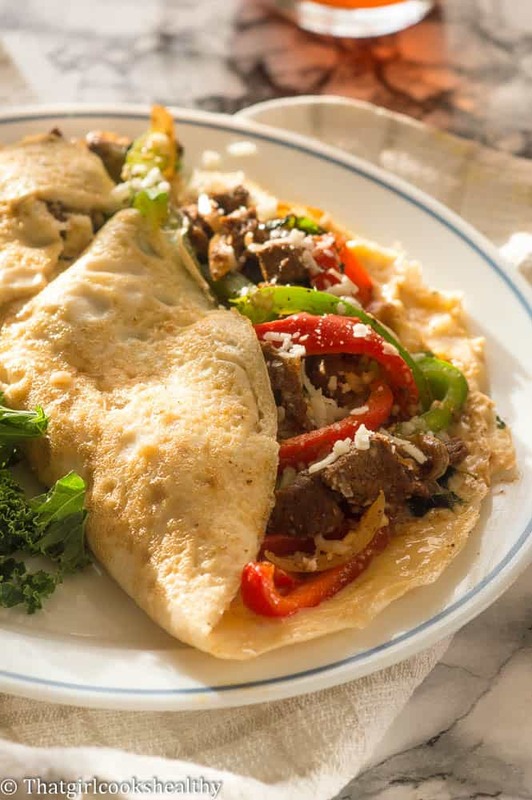 Why not start the day on a protein loaded note with this egg white Philly cheese steak omelette, it’s so filling that this cheese steak omelette should keep hunger at bay up to lunch time. Great for those who follow a high protein, low fat lifestyle – if you’re looking to build muscle mass then this recipe is for you. Also, if you enjoy a healthy cheese omelette with pieces of beef then this is the omelette for you! Apply the steak seasoning to the beef and set aside than proceed to sautee the onions. Add the bell peppers to the saucepan along with the kale and continue to cook. Finally add the beaten egg whites to the skillet, rotate the pan to the sides so the egg seeps underneath the pan evenly and bottom cooks through. 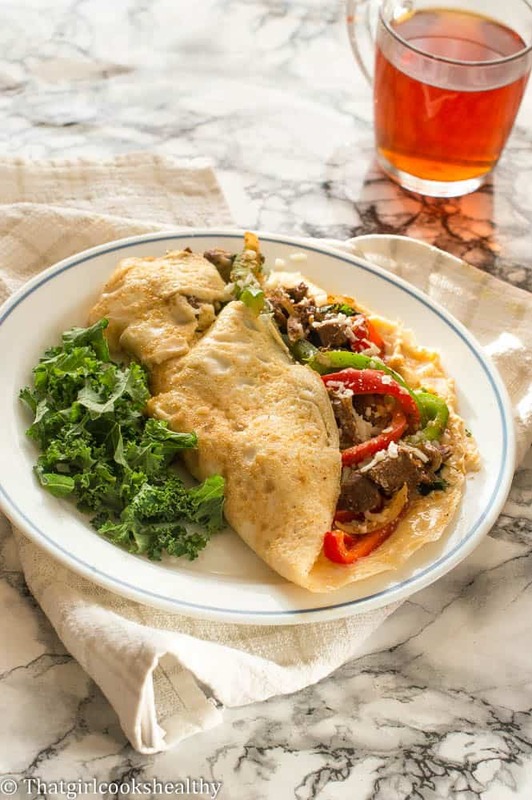 Add the beef, peppers, kale and cheese to one side of the omelette before folding it over. On medium heat 2tbsp of coconut oil in a large non stick frying pan then proceed to sautee the onions until translucent and tender. Add the kale and bell peppers along with the steak pieces and sear the steak to your preference before removing the entire contents from the pan to set aside. On low to medium heat, pour the beaten egg whites into a pan, cook until the set starts to set, at the same time, carefully lift edge while tilting the pan to allow the under cooked egg to run under the set portion. Add the steak and veggies to one side of the omelette then top with vegan cheese. Use a egg spatula to sandwich the other side of the omelette so it looks like a crescent.